The new GeForce GTX 1070 Ti graphics cards are here and today we are going to look at and review the MSI GeForce GTX 1070 Ti Titanium 8G graphics card. You know, “Ti” on the GeForce graphics cards stands for Titanium, right? So you literally get twice the Titanium with this MSI graphics card! Jokes aside, the MSI GTX 1070 Ti Titanium is just one of the GTX 1070 Ti that the company recently released. MSI also released the GTX 1070 Ti GAMING, DUKE, Armor and Aero. The GTX 1070 Ti Titanium sits on top or side by side with the GAMING variant. They basically have the same cooler design, except for the color scheme and no RGB on the Titanium, and the same clock speeds out of the box. In fact, all GTX 1070 Ti cards on the market, regardless of brand or model, have the same clock speeds. NVIDIA restricted or prevented AIB partners from selling factory overclocked GeForce GTX 1070 Ti cards. But this doesn’t mean you can’t overclock the GTX 1070 Ti; you can and we have overclocked this GTX 1070 Ti Titanium. It is easy to overclock the GTX 1070 Ti and the results that we got are very familiar (ahem GTX 1080). 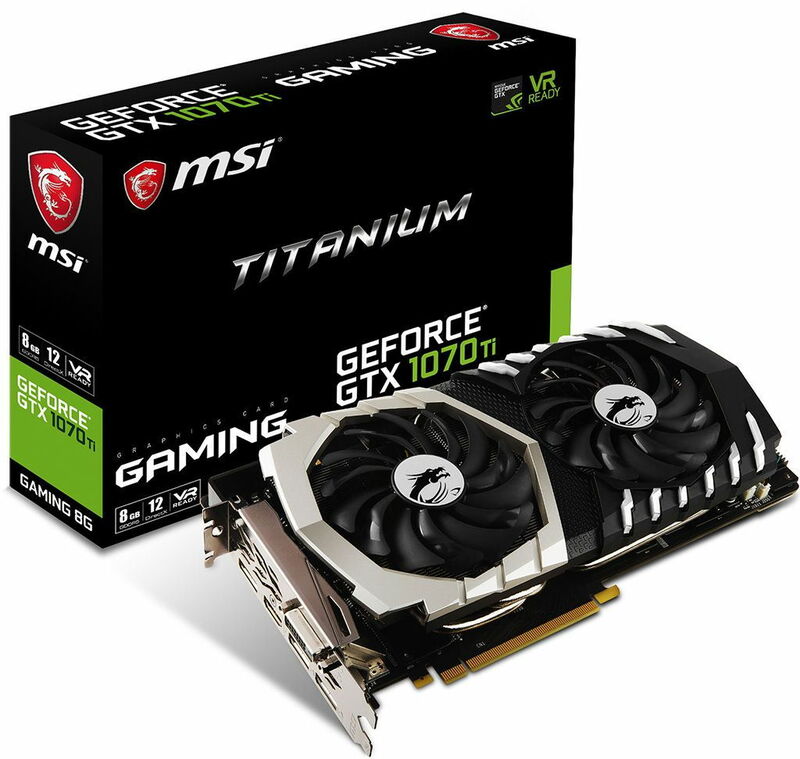 Interested in getting a new GTX 1070 Ti, or you just want to know how fast this graphics card is; please continue reading our MSI GTX 1070 Ti Titanium review below. MSI GeForce GTX 1070 Ti Titanium 8G Review – More Titanium for You! By now, you probably know that NVIDIA released the GeForce GTX 1070 Ti after AMD released their RX Vega 64 and Vega 56. The GeForce GTX 1070 Ti is basically NVIDIA’s answer to the Vega 56. The RX Vega 56 was performing quite well and in most occasions it’s faster than the GTX 1070. Meanwhile, the GTX 1080 and the RX Vega 64 are trading blows, and resulting in a not-really-solid win for RX Vega 64. Many people and reviewers are actually questioning the release of the GeForce GTX 1070 Ti since the performance gap between the GTX 1070 and GTX 1080 is not that really big. Also the price difference between the GTX 1070 Ti and GTX 1080 is not that huge at all. If you can spot a good GTX 1080 deal, then it’s still the better buy compared to the GTX 1070 Ti. However, the GTX 1070 Ti is not without merit. It’s actually near and more of a GTX 1080, instead of a GTX 1070. You can see that from the specifications table below. Performance wise, the GTX 1070 Ti sits right in between the GTX 1070 and GTX 1080. We don’t have an RX 56 on hand to compare it with, but based on other reviews it seems that the GTX 1070 Ti got the job done at taking the spotlight from the RX Vega 56. Not to mention the entire RX Vega lineup is having price and supplies issue. NVIDIA restricted all partners to ship a GTX 1070 Ti with factory overclock settings; perhaps to prevent it from cannibalizing the sales of the GTX 1080. However, it doesn’t mean you can’t overclock the graphics card. In fact overclocking it will result in a performance near or on par with the GTX 1080. You can see that from our benchmark results in the following pages. The MSI GeForce GTX 1070 Ti Titanium 8G, like all of the GTX 1070 Ti, features 2432 CUDA cores. It’s only 128 CUDA cores away from the GTX 1080, but it is 512 CUDA cores more than the GTX 1070. The rest of the specs are very similar with the GTX 1080 as well, except for the memory type used. The GTX 1070 Ti uses GDDR5 instead of GDDR5X that is used on the GTX 1080 and above. At the heart of every GeForce GTX 1070 Ti graphics cards is a GP104-300-A1 GPU chip; featuring a base clock speed of 1607 MHz with a boost clock speed of 1683 MHz. It has a memory speed of 8Gbps, which is similar with the GTX 1070; 8GB of GDDR5, 256 GB/s memory bandwidth and runs on a 256-bit memory interface. However, it slightly draws more power at 180W, which is similar with the GTX 1080. Like I said, the GTX 1070 Ti is more of a GTX 1080, rather than a GTX 1070. You can check the full specifications below. I didn’t include the Founders Edition since they are basically similar with all GTX 1070 Tis on the market. The only difference is the cooler design and some proprietary features. On the next page, let’s learn more about the features of the MSI GTX 1070 Ti Titanium. For US: available at B&H here or Newegg here.